With the Scottish Government GERS figures published on Wednesday, the pro-independence spin-machine has been in over-drive trying to prevent people understanding what they show us. The SNP’s own Independence White Paper clearly stated that GERS “provides a useful indication of the relative strength of Scotland’s public finances as part of the UK and a starting point for discussions of Scotland’s fiscal position following independence”. So let’s cut through the spin and discuss what this starting point now tells us. The latest GERS figures show Scotland’s deficit is £1,900/person higher than the rest of the UK. This is the Deficit Gap - the amount effectively transferred to Scotland through UK-wide pooling & sharing – and it’s worth over £10 billion a year. The graph on this page explains how that Deficit Gap arises. The green line shows that Scotland’s onshore economy consistently generates about £350 per person less tax income than the rest of the UK. 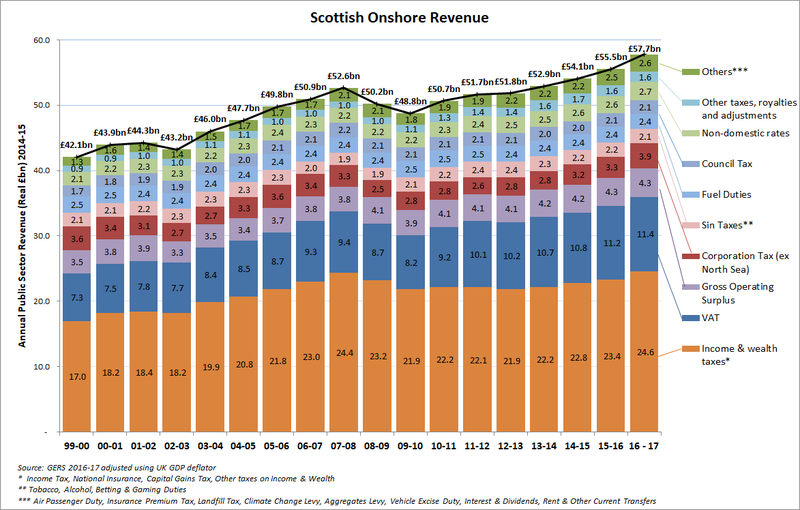 The black line shows what happens when you add on to that Scotland’s North Sea oil revenues. When the black line has been above the axis, Scotland has generated relatively higher tax that the rest of the UK - that has only ever been because of North Sea oil. With oil revenues now close to zero, Scotland would be reliant on its lower than UK average onshore revenues to fund its public spending. The rest of the deficit gap – the large majority of it – is explained by Scotland’s now over £1,500/person higher spending, shown by the red line on the graph. The fiscal framework (underpinned by the Barnett Formula) ensures that Scotland can maintain these higher spending levels despite the loss of oil revenues. That’s what pooling & sharing means, that’s the safety net we would have lost had we voted Yes in 2014. 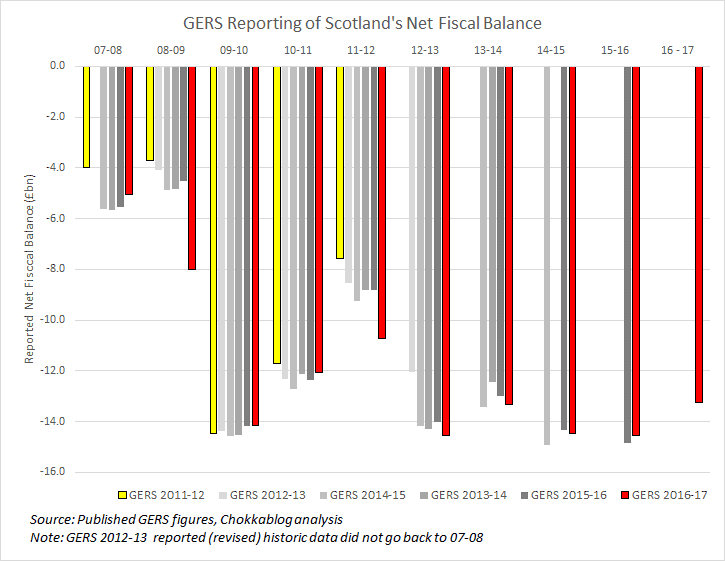 When the black line is higher than the red line, GERS figures demonstrate Scotland having stronger public sector finances than the rest of the UK. That’s only been materially true once in the last 17 years, when oil peaked in 2008-091. That’s why the SNP’s independence White Paper assumed North Sea revenues of £6.8 - £7.9 billion a year – it was the only way they could make their economic case add up. Many of us observed at the time that those forecasts were recklessly optimistic. Now the actual figure turns out to be close to zero, we’ve been proven right. So how do the SNP deal with this inconvenient truth? They hint that we can’t trust the data because estimates are involved – neglecting to mention that these qualify as National Statistics and that the main differences they highlight relate to spending, where actual figures not estimates are used. They talk in non-quantified terms about “different spending choices”, nearly always using Trident as their example - neglecting to mention that our share of Trident costs account for maybe £0.2bn of our allocated defence spending. In fact the SNP’s notoriously optimistic independence White Paper could only find net savings of £0.6bn through “different spending choices”. No amount of SNP obfuscation can hide the fact that their economic case relied on nearly £8bn of oil revenues and they’ve yet to offer a credible answer as to how an independent Scotland would manage now those oil revenues have gone (and the fiscal gap is in fact now over £10bn). 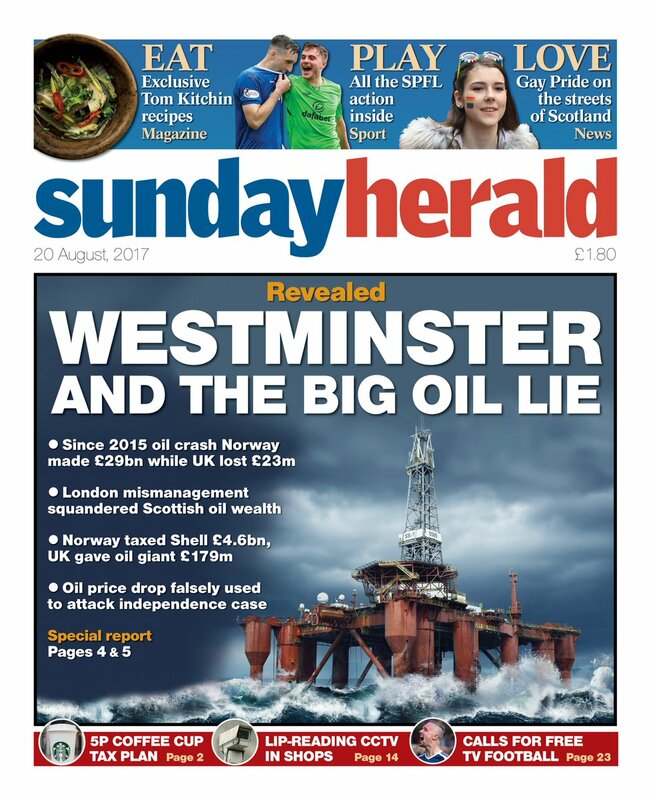 So in what looks like a frankly desperate move, last week-end’s pro-independence press ran headlines blaming “Westminster mismanagement” for the decline in our oil tax revenues. The support offered for this was a report from the unashamedly pro-SNP and notoriously flaky “Business for Scotland”. 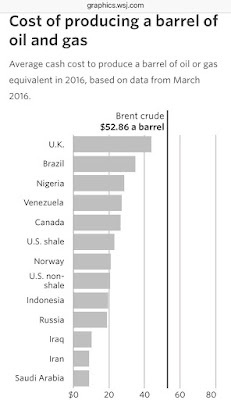 The report itself did little more than observe that Norway has generated lots of tax revenue from oil in the last few years and suggest that it would therefore “not be unreasonable to add Norway’s £11bn revenues” to Scotland’s fiscal balance2. I mean seriously? They might just as well argue that it wouldn’t be unreasonable to add the taxes generated by Norway’s forest and timber industry to Scotland’s fiscal balance, seeing as how we both grow trees. 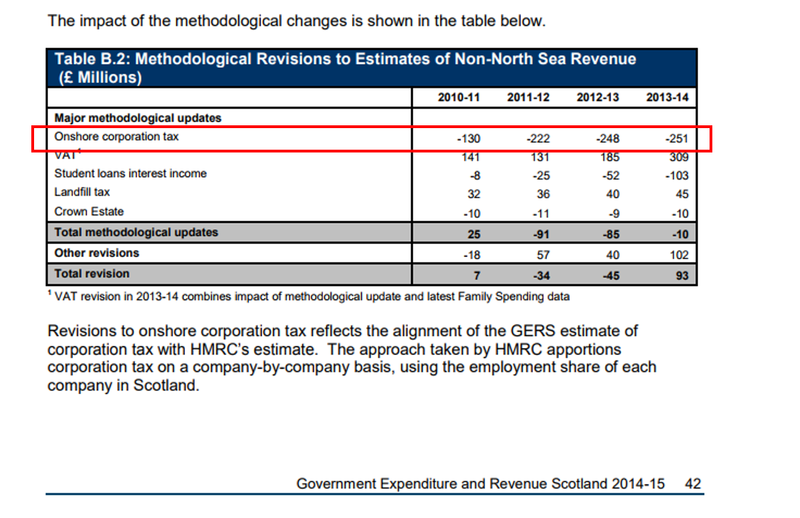 To be clear: North Sea revenues are generated by taxing production profits. While it’s true that both the Norwegian and UK industries are exposed to the same oil market prices, our costs of production are much higher, our production volumes are lower and with more mature reserves we’re incurring greater decommissioning costs. This means the UK offshore industry simply doesn't produce production profits like Norway’s does – and without profit there is no tax. 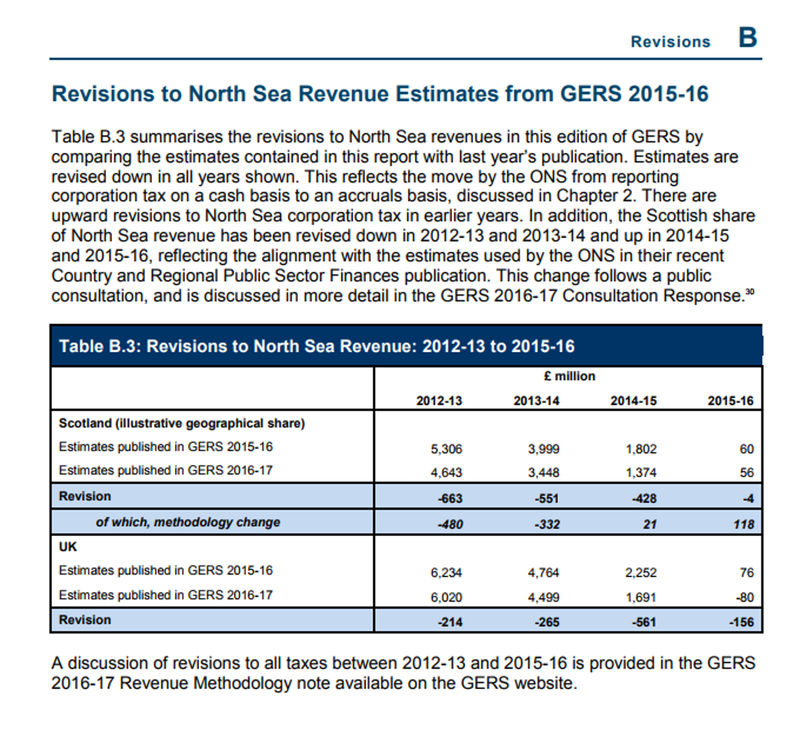 The Business for Scotland report even argues – incredibly - that Westminster has failed to tax the North Sea oil industry heavily enough since the oil price crash in 2015. Do they think voters have memories like goldfish? 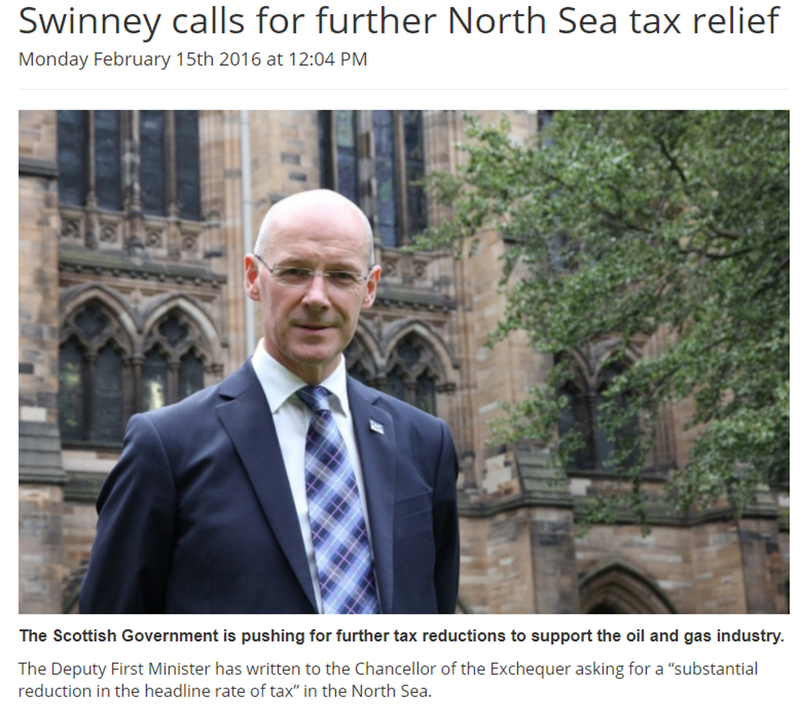 Quite how protecting Scottish jobs by reducing the tax burden on the North Sea oil industry – as called for and celebrated by the SNP – is “mismanagement” is anybody’s guess. In fact the decline in profitability of our oil industry has been so dramatic that even if tax rates hadn’t been cut, the revenue generated would have dwindled to close to zero anyway, but that’s by the by. 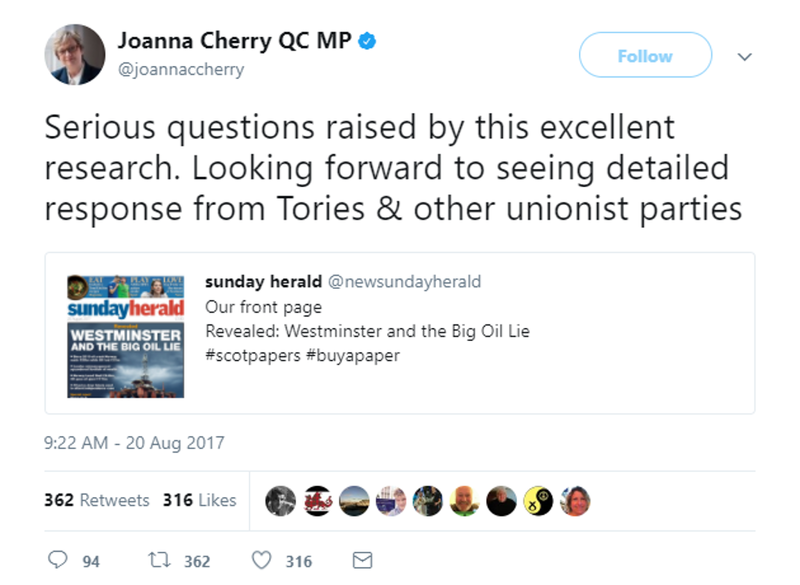 To put the cherry on the cake, SNP MP Joanna Cherry QC took to Twitter to promote the Business for Scotland report, saying “Serious questions raised by this excellent research”4. 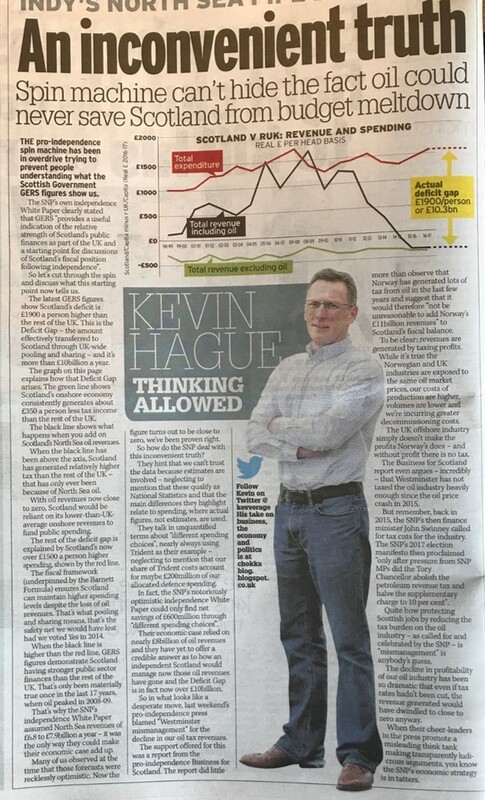 When their cheer-leaders in the press and one of their high-profile MP’s promote a misleading think tank making transparently ludicrous arguments, you know the SNP’s economic strategy is in tatters. Let's start with the simple headline fact: Scotland's GERS deficit was £13.3bn last year, a slight improvement on the previous year1. Of course we're not an independent country, we voted No. This means that the deficit that really matters to us is the UK's, because that's the one which we share. 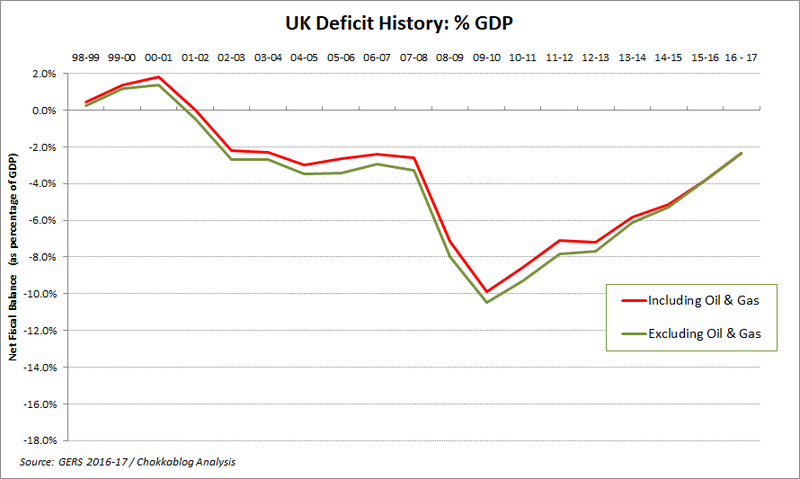 The UK's deficit, on the same basis, is 2.4% and improving steadily. At this point somebody normally pipes up that this proves the UK's economic strategy is failing Scotland because the UK as a whole is improving but Scotland isn't. This is of course a rather daft observation. It's daft because it doesn't allow for the impact of North Sea oil revenue declining due to the global oil price crash and maturing North Sea reserves. 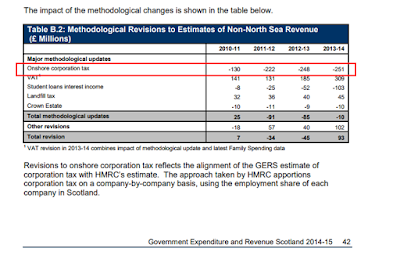 North Sea oil revenues are now effectively zero3, as the OBR and many of us predicted some time ago. This of course contrasts rather dramatically with the £6.8 - 7.9bn annual North Sea income that the Independence White Paper recklessly predicted. We can easily exclude the impact of this North Sea decline by looking at Scotland's onshore economy only (the green line below). This shows that our onshore economy has in fact been improving broadly in line with the trend for the UK as a whole4. "But hold on Kev" I hear you ask, "if it's all about the loss of oil revenues, surely that's a problem for the UK as a whole as well?". The answer to this is simply that the North Sea is proportionately way less important to the economy of the UK than it is to Scotland. Here's that same graph on a total UK basis - makes the point pretty clearly I think. 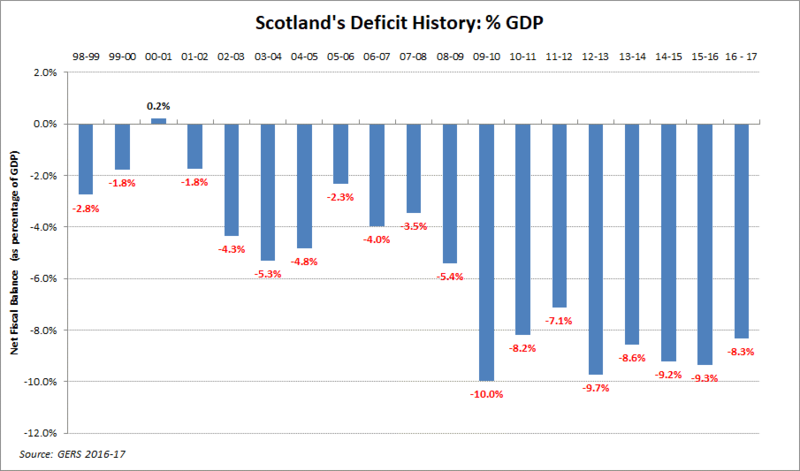 So the apparent lack of progress on Scotland's deficit is really just due to the fact that we used to have oil and now we pretty much don't. The improvement in our onshore economy's performance is masked by the decline in our offshore revenues. 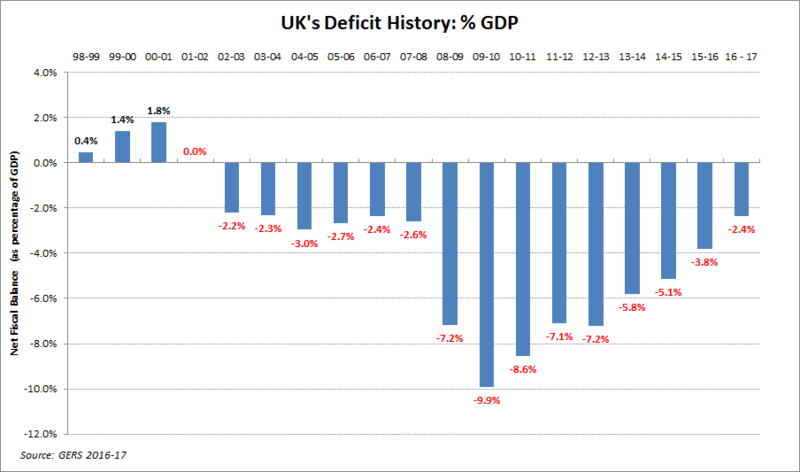 But now oil's gone, why in relative terms is our deficit so much worse than the UK average? 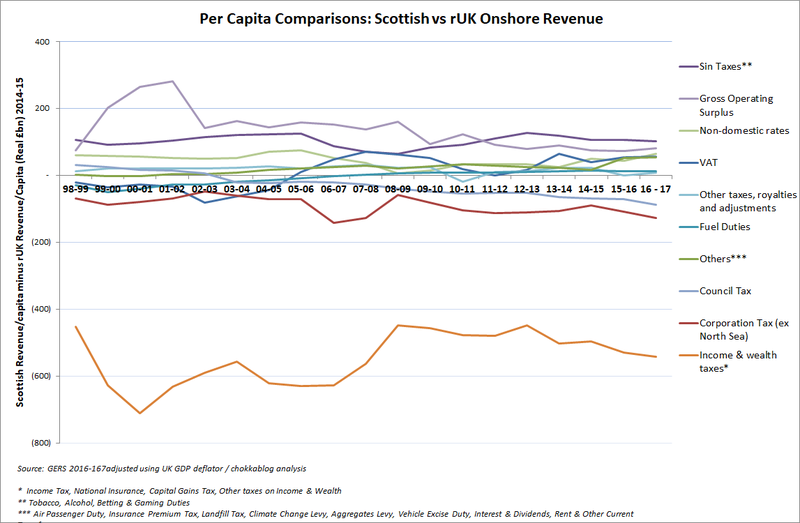 This is easily explained by looking at Scotland's revenue generation and expenditure (on a per capita basis) versus the rest of the UK. Regular readers will be familiar with this graph5. The figures below are all in real terms (i.e. adjusted by the UK GDP deflator). The most notable difference relate to oil revenues which have been revised down in recognition of the fact that the ONS accruals and estimation methodology is considered more appropriate than the previous methodology used6. I can only imaging the fury that would be unleashed from the pro-independence camp had a similar admission of historical revenue under reporting had been made. 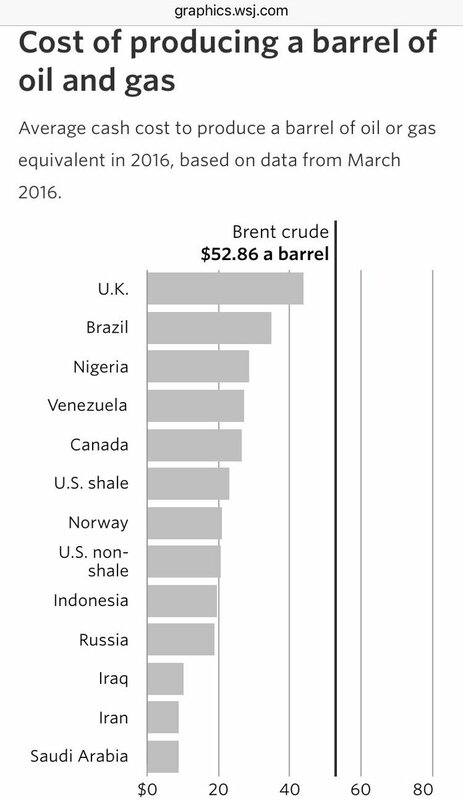 Black line: when you include oil revenue, we've historically generated considerably more revenue than the rest of the UK, sometimes (most recently 2011-12) enough that our higher revenue more than compensates for our higher spend. The difference between the red and the black lines is our per capita deficit gap, the amount by which our per capita deficit exceeds (or not) that of the rest of the UK. Here's an updated plot of this gap - the trend is clear. If the shoe was on the other foot I think I can safely say the nationalists would be up in arms about this. For what it's worth, I and others who paid attention had always argued that it was reasonable to assume the figures would if anything err on the side of generosity to Scotland - and I believe those compiling the data at the time acted in good faith. So if you're expecting a rant about these revisions, I'm sorry to disappoint. 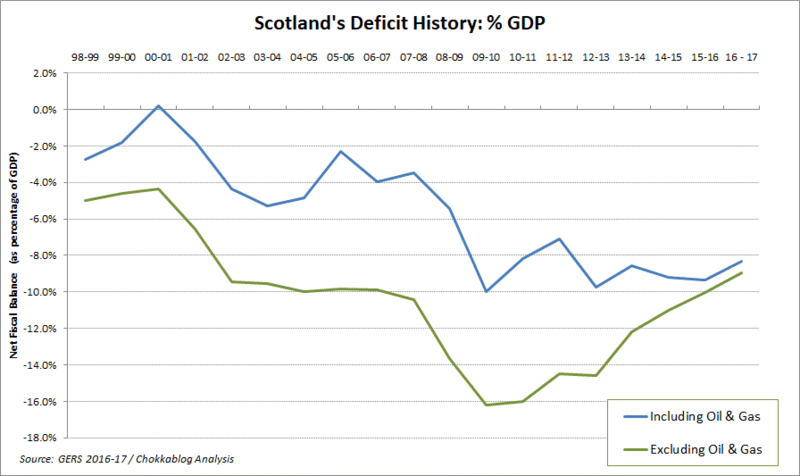 What these graphs tell us - and what this blog has frequently argued - is that there's long been an onshore deficit gap of about £9.0bn between Scotland and the rest of the UK. This was simply masked by surges in oil revenue. When the oil revenue goes (as it has now), that deficit is exposed. The idea that oil was ever just "a bonus" for the independence case is risible. 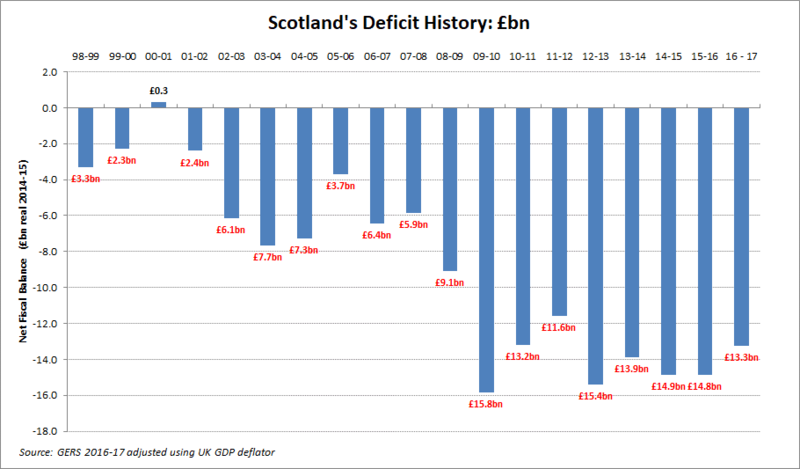 We can safely say that, for the last decade and more, there's consistently been an £8 - 10bn onshore deficit gap between Scotland and the rest of the UK and there's currently no sign of it going away. This is the "black-hole" that some of us keep banging on about. Let's clear a common point of confusion: the "black-hole" doesn't mean the deficit. It means the amount bigger our deficit would be than that we now share with the UK ... if we were independent and still raising and spending public funds at the rate shown in GERS. This matters in part because we could continue our trajectory of onshore revenue growth and slower spending growth and eventually we would eliminate (or at least reduce to manageable levels) our deficit - but we wouldn't close the gap with the rest of the UK unless we raise revenues faster or increase spending more slowly than them. As long as we perform on the same track that gap remains - a gap that now translates into an effective fiscal transfer from the rest of the UK to Scotland of £10bn a year or £1,900 for every man, woman and child in Scotland. Is it fair that we should receive that money? Well there are two ways of answering that. Firstly you could argue that the principle of union is that we receive equal levels of service from the state (not equal levels of spending) and so if an area is high "cost-to-serve" it should receive more public funds. Think Scottish islands and rural areas being subsidised by Scottish cities. Scotland is high cost-to-serve relative to the rest of the UK because of low population density and dispersed communities, but also because we have health and demographic challenges (see Two Types of People). Secondly you could argue that it's the quid pro quo for the fact that when we have a windfall like North Sea oil, we share it. 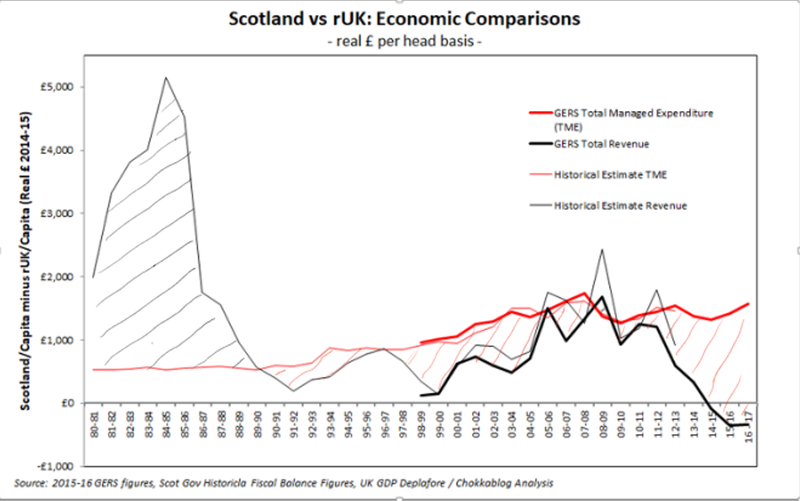 We definitely did share it of course - if you start the clock in 1980 (the most favourable point to do so from Scotland's perspective) we can see clearly that for a long time Scotland was a massive net contributor to the UK's economy (when black line is above red - excuse my scruffy shading) . For what it's worth, if you sum up the total real terms net contribution by Scotland to the UK over this time period we are still "in credit" by about £7k per capita (so at the current rate of transfer we'd still be in credit for another 3 years). Nobody in Scotland needs feel embarrassed by the fiscal transfer - we are pooling and sharing over time as well as geographically. Of course we could try and run this calculation from 1707, but that way madness lies. Nobody is arguing that an independent Scotland wouldn't want to and indeed have to do things differently - but GERS does show us the starting point, the run-rate, the pro-forma accounts on which an independence case needs to be built. 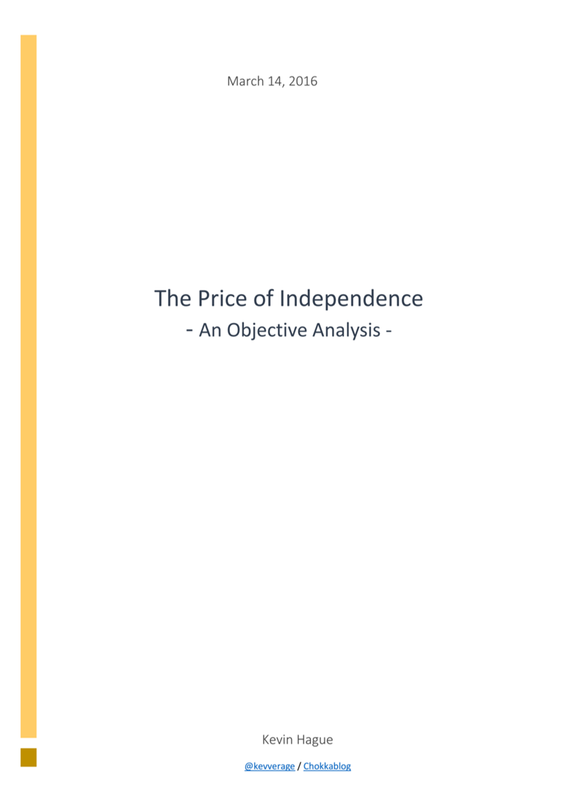 Those who champion independence have to make a credible for case for how and why and by how much we'd change the GERS figures by being independent. Just saying "the GERS figures tell us nothing" simply doesn't wash - they tell us what happens if we were to keep taxing and spending at these levels (and why we can't). Of course some of that money is controlled by Westminster. In the cases of debt interest and defence these cost are allocated to us on a per capita basis. The other main reserved expenditure is elements of social security, most notably pensions, which are allocated on an actual spend basis. Remembering that the value of the fiscal transfer from the rest of the UK to Scotland is £10bn, it's worth noting that if you (ridiculously) assume no debt and no defence costs at all we'd still be looking for £4bn a year if we were out of the UK and wanted to continue to spending these other sums (without running a greater deficit than that we share with the UK). Public order & Safety, but the centralisation of Police Scotland appears to have put paid to that. There has been a long overdue - but to be applauded - marked increase in Education and Training spend. Social Protection appears to have (relatively) increased dramatically - I'm not sure what's driving that. Last year when looking at this figures I said "So we can see where we spend more and this adds up in total to £1,300 per capita (presumaby it will be more if ONS decide Scottish Housing Associations should also be classified as public expenditure)". Sure enough that's exactly what has happened (again: GERS previously erred on the side of generosity to Scotland) so the revised figure for 2015-16 if £1,419 and this year the figure is £1,566 per capita higher public spending in Scotland. 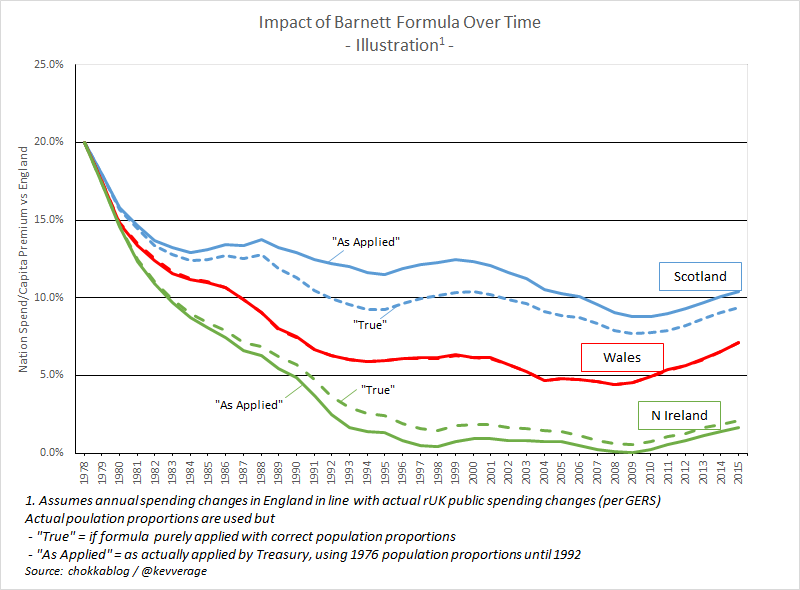 If we're to close the deficit gap - to reduce our dependence on Barnett - we could of course simply spend less. The figures above give you a starting point to try and find £10bn. Suffice to say a £10bn reduction in spend would be an order of magnitude greater than any cuts we've seen under "Tory austerity". If we cut all of those budgets by these amounts we’d save £1,531/capita. Add that to the White Paper’s optimistic £111/capita saving (mainly from the allocated defence budget) and you’ve got a £1,642/capita or £8.9bn saving versus the 2016-17 GERS figures. So still doesn't quite get us there! This shows a very encouraging real-terms growth trend which is in-line with the UK as a whole. Now you either see this as showing that Westminster's economic policies work for Scotland as well as they do for the rest of the UK or (if you aren't too busy arguing that GERS numbers show us nothing of value) that they show what a super job the SNP are doing. Given the SNP have refused to use our hard-fought-for tax raising powers to any meaningful degree, I find it hard to conclude that this is anything other than the UK's economic strategy working for Scotland's onshore economy. 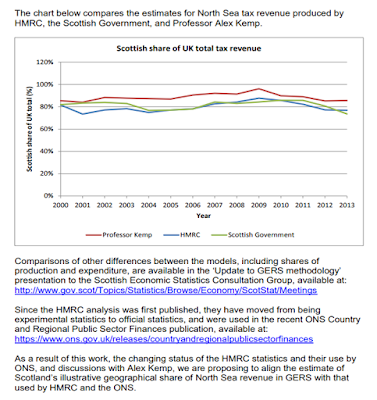 As noted before on this blog, we depressingly raise more per capita in sin taxes (tobacco & alcohol duties) and the corporation tax assumption is the one big "punt" in GERS: companies don't report profits split between Scotland and rUK so it's frankly a guess. The key point is that this guess is not a material factor in explaining the lower revenue generation we see - that's clearly down to lower income and wealth taxes. Basically, on average Scots are paid less and we are less wealthy than the average of the rest of the UK (but certainly not more than all other UK regions, to be clear). 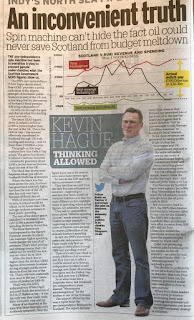 So I think we've understood the GERS figures through these graphs and they produce no surprises. If we'd have voted Yes the oil decline would still have happened and the gap that is being filled by fiscal transfers from the rest of the UK would have to have been filled from elsewhere - some combination of spending reductions, tax rise or even higher borrowing. That's before we even start to consider the immediate cost of independence, currency issues, business flight etc. We can safely conclude that those of us who voted No helped us dodge a bullet. Even Yes voters can't deny that we now receive an effective £10bn fiscal transfer from the rest of the UK, that pooling and sharing works massively in our favour. The question remains: how do we improve the economy of Scotland, how do we deliver not only onshore revenue growth in-line with the rest of the UK but revenue growth that's superior to the rest of the UK? Only by answering this question can we reduce the fiscal transfer without drastically cutting our public spending. A quick dash through today's GERS figures - apologies if not as finely crafted as I normally aspire to! This represents the scale of the challenge facing anybody trying to make an economic case for separation: these are our economics within the UK, they need to show how if we were independent our tax/spend figures would change vs those in GERS. They need to show where they'd find £10bn pa of additional revenue or reduced spending (including reductions compared to currently per-capita-allocated costs like defence) to offset what we'd lose from UK-wide pooling and sharing. 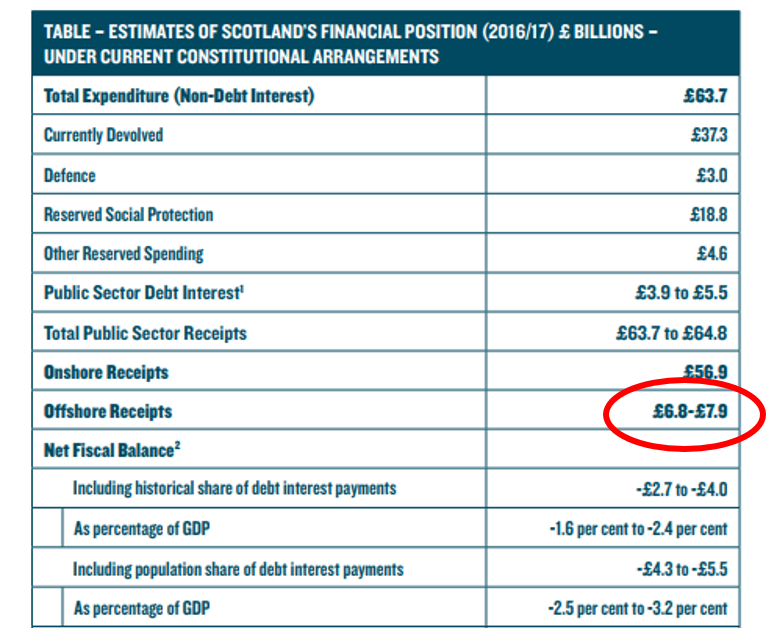 When this exercise was attempted by the Independence White Paper they optimistically assumed £0.6bn of net cost savings and plugged the remaining gap with £6.8 - 7.9bn of oil revenues. Nobody's buying that any more. 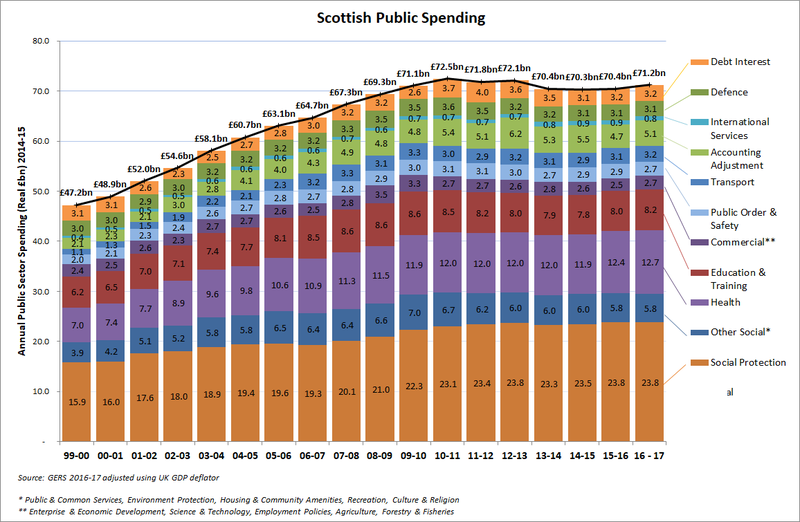 The red line shows Scotland’s relatively higher public spending, a figure which has risen in recent years to over £1,500/person more than the rest of UK. This has happened at least in part because of the way the current fiscal framework (under-pinned by the Barnett Formula) relatively favours Scotland. Needless to say this hard evidence that UK pooling and sharing has allowed a relative increase in Scottish spending in recent years is not something you’ll hear the SNP mention. The green line shows that Scotland’s onshore economy consistently generates about £350/person less than the rest of the UK average. 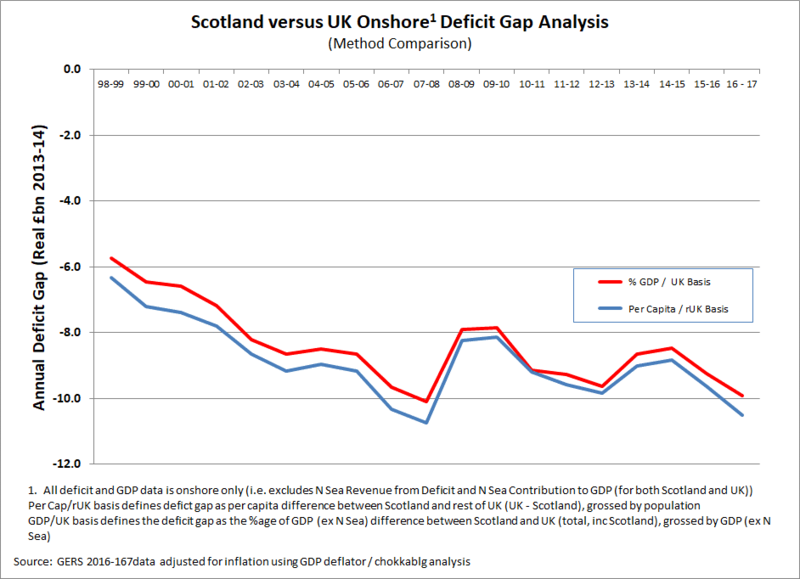 The gap between the green and red lines represents the “Onshore Deficit Gap” – a gap which is large and growing. 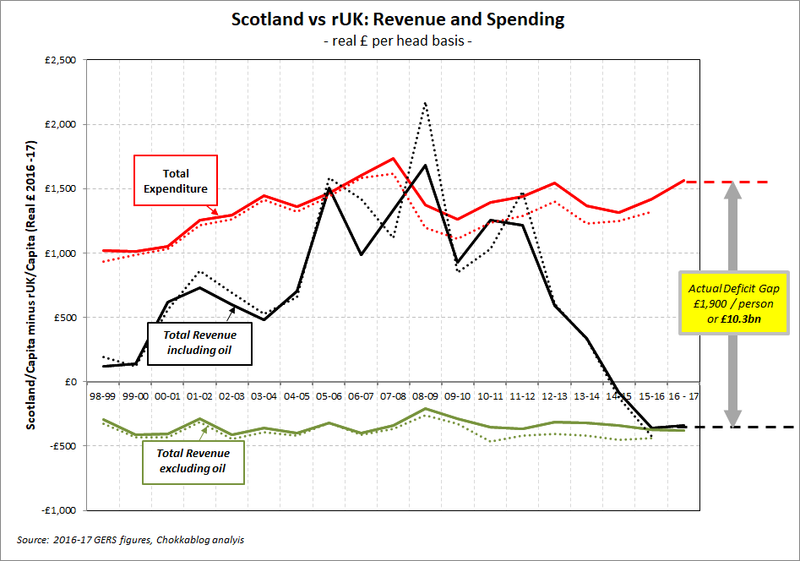 The black line shows what happens when we add Scotland’s volatile oil revenues to the picture. 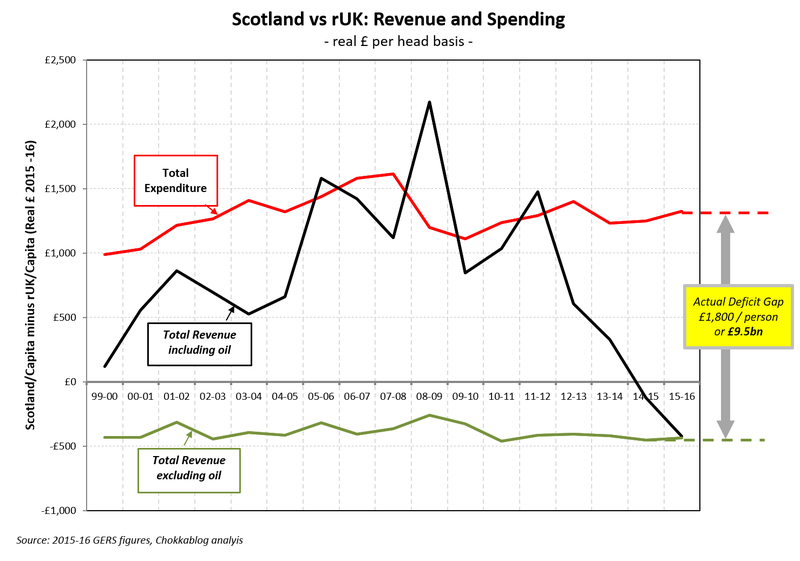 In just two recent peak oil years (when the black line is above the red), oil revenues were enough to compensate for Scotland’s higher spending. 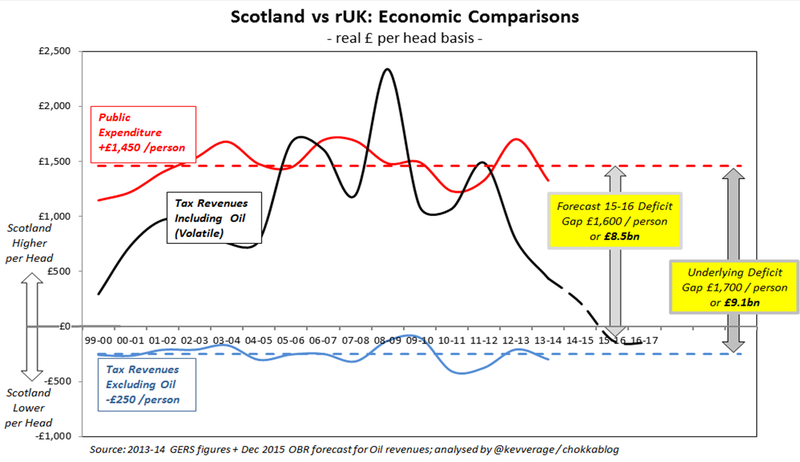 People familiar with this graph may have noticed that the historical data has been restated to look far worse for Scotland than it used to, something which seems to be explained by improvements to the oil revenue allocation methodology. 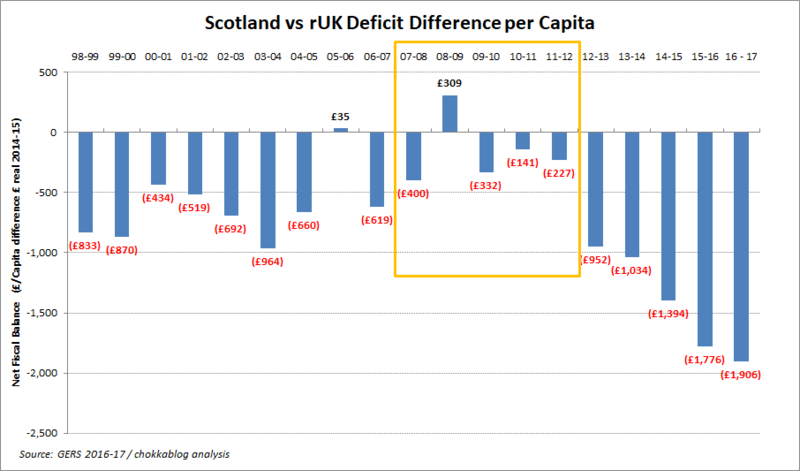 Here's the same deficit gap graph showing the figures as they were reported last year as dashed lines. This is more than a little ironic given some of the guff that has circulated on social media recently about RTS data presentation changes meaning we've "found" £15bn. In fact the historical figures have been shown to have been on the optimistic side, as many of us argued was always likely. So the GERS report shows that - largely because of our higher spending - the starting point for discussion about the economics of independence is that it would make us over £10bn worse off. That’s £1,900 a year worse off for every man, woman and child in Scotland. The SNP spin-machine is of course now in over-drive to try and prevent Scottish voters understanding what these GERS figures mean. 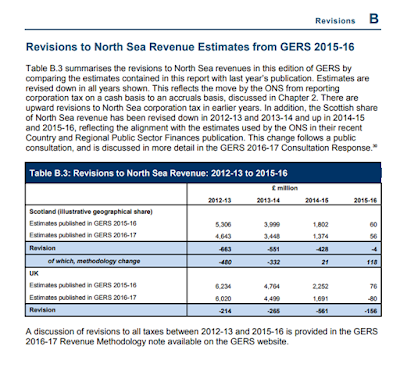 But the SNP can’t escape what their own Independence White Paper correctly told us: “[GERS] provides a useful indication of the relative strength of Scotland’s public finances as part of the UK and a starting point for discussions of Scotland’s fiscal position following independence”. What this starting point now tells us is that with North Sea oil revenues close to zero, an independent Scotland would need to dramatically cut the levels of public spending Scots are used to receiving. This is the discussion we should be having and the one the SNP is studiously trying to avoid. 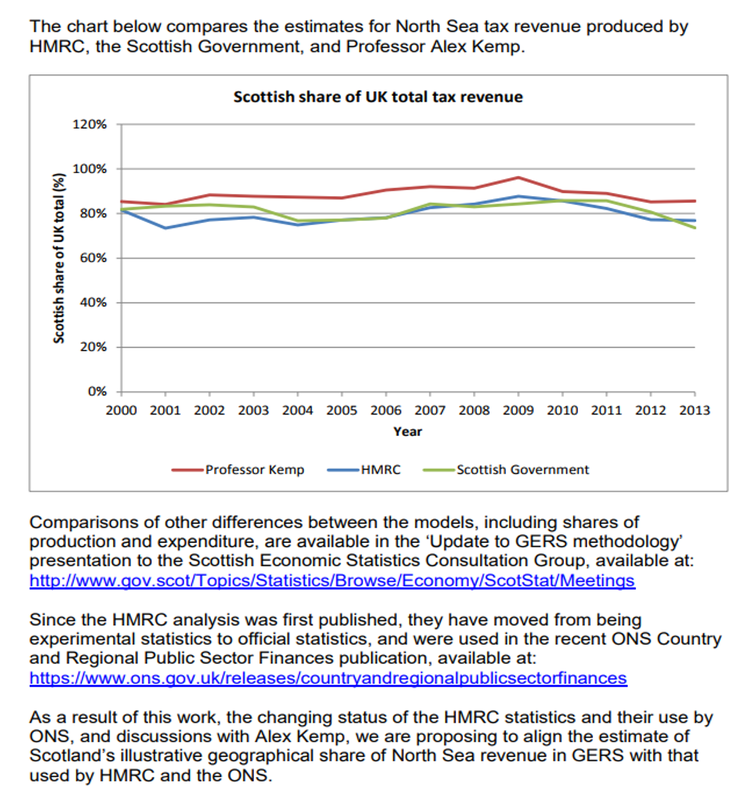 The SNP could try and argue for superior onshore revenue growth as a result of independence. The problem they have there is that with unresolved issues around currency and the fact that we’d be leaving the UK-single market (which is four times more important to Scotland as an export market than the EU) there is far more likely to be downside rather than upside for our economic growth prospects. To be clear: nobody is saying that trade with the UK would stop – but if an independent Scotland were to end up on the wrong side of EU/UK trade barriers, it’s hard not to believe that trade would be damaged. Even if the SNP do come up with a credible case for independence creating new economic growth, something they’ve conspicuously failed to do to so far, under any realistic assumptions it would take generations to close the Deficit Gap through revenue growth alone. The notoriously optimistic Independence White Paper could only find £0.6bn of net savings versus the GERS figures (equivalent to £110/capita) – a figure which of course includes the defence/Trident savings which are the most commonly used rhetorical ammunition in this debate. 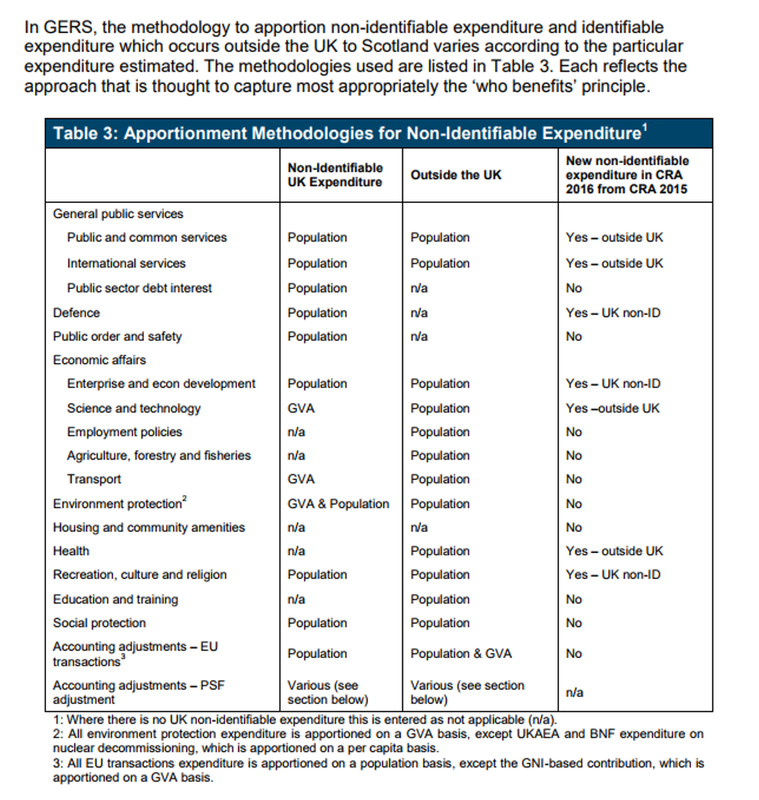 It’s worth noting for those who attempt to deflect from this debate by saying GERS figures are estimates and allocations; that’s not true for the figures where per capita spend differences are shown – these are all based on known actual spending data. 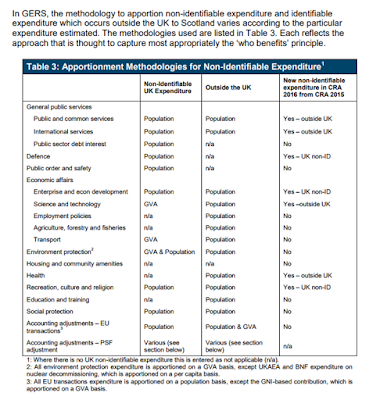 We can easily illustrate the scale of what we’d have to do to get £1,500/person from the areas where we spend more on a per capita basis, because the figures are all in the GERS report if you know where to look and are able to manipulate a spreadhseet. Of course there may be good reasons why our spending levels are higher: demographics and population density being obvious factors - but they wouldn't go away if Scotland were independent. If we cut all of those budgets by these amounts we’d save £1,531/capita. 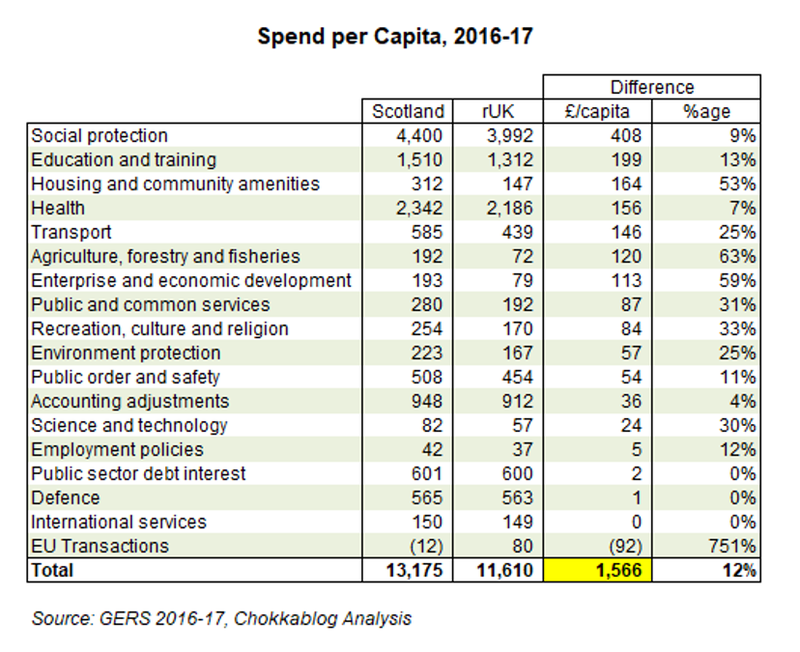 Add that to the White Paper’s optimistic £111/capita saving (mainly from the allocated defence budget) and you’ve got a £1,642/capita or £8.9bn saving versus the 2016-17 GERS figures. All that pain and we still wouldn’t have quite managed to close the deficit gap with the rest of the UK. 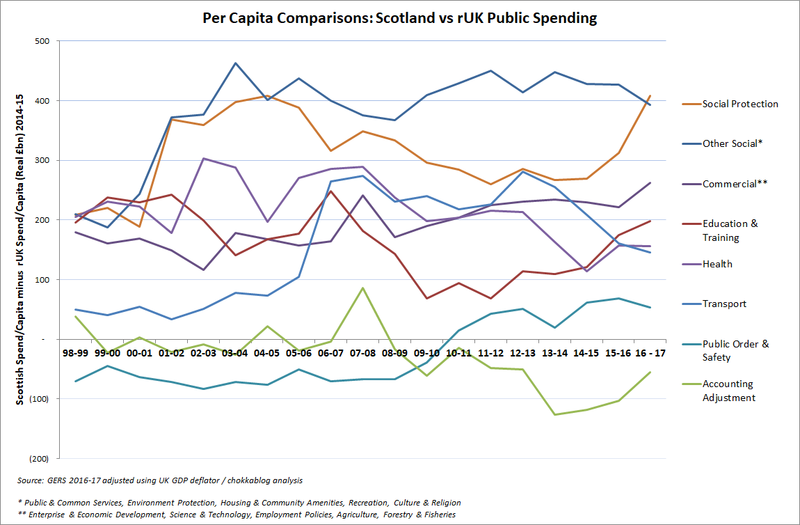 Swingeing cuts to public spending which would make recent austerity look like a walk in the park, and an independent Scotland would still have a slightly worse per capita deficit than that we currently share with the rest of the UK. It’s not surprising the SNP are spinning like crazy to try and avoid these GERS figures being rationally debated. The latest GERS figure proves beyond doubt that the economic case for Scottish Independence is dead in the water.